It’s Sunday morning, it’s bright, sunny, windy, and lake is blue, as blue as the early morning light colors the water. Wind rustles through the trees and blows in through the open screen door and through the cottage. Last night, a front blew through the area and brought much cooler and drier weather. It is the same front, which blasted though the Chicago area and later northern Ohio with high winds, lightning, and rain. We were supposed to get storms with rain and high winds, but nothing happened; the storm broke up before it arrived. We got pleasant weather instead. I’ll take the trade-off, anytime. W and I head back home later today. I have school, meetings, and staff development. W has football, scouts, and school looming on the horizon and a, a book to finish. Ivy will be coming, too and she’ll re-acquaint herself with the yard. Momma and O will come home later in the week and we’ll all get ready for school, together. 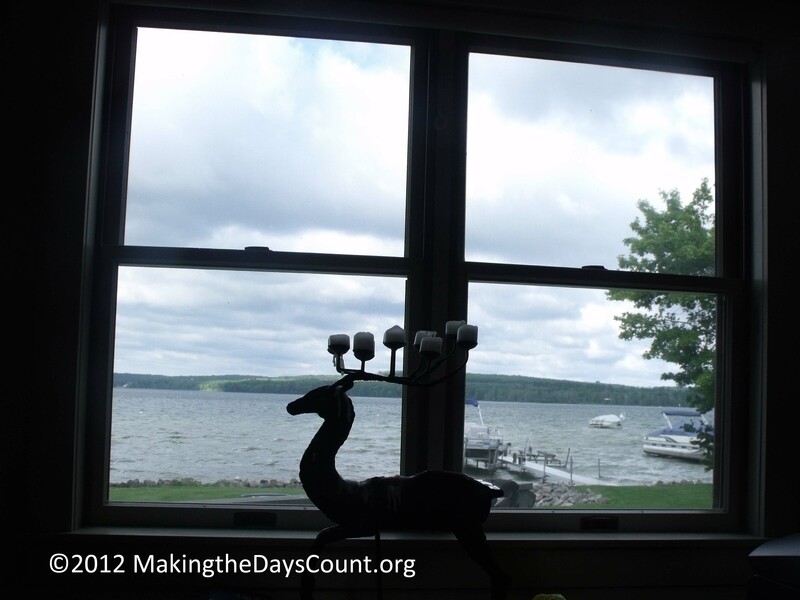 When I first began the blog, the post titles were numbered by day, today’s post title might have been Day 65: last Sunday morning by the lake. However, when school started, that first year and I kept the blog running, I had to re-think my titles and the day numbering went by the wayside. But, I still know the days, the number of days left, the number of days spent, all accounted for; I have gone through my planner using the coming school calendar numbering the school days in anticipation of the first day, just fifteen days away. I knew this day was coming, it always does. Yet, is doesn’t have the anticipation of the day before Christmas, or Spring Break, or summer vacation. More like a trip to dentist, a test, or a day of yard work. The last day before going home is always difficult. It’s full of urgency; have to dos and need to dos and few want to dos. Summer has been full of want to dos and I have enjoyed the break. It has been good for me and I have gotten the rest I need to recharge for the coming year. Friday and Saturday were full of have to dos and need to dos, but there are more, there always are. It’s time to post and get moving and check off a few of the have to dos, pack, and drive home. Today is gonna be a great day, I have to remind myself. Making the Days Count, one day at a time, even packing up and going home. What’s the hardest part of the end of a vacation or break for you? I would think that in today’s classroom, teaching would be so much fun since you can learn along with the students. I think that is why I enjoy blogging and readers others. I am always learning! I am excited about school starting – new students, fresh ideas, and looking for ways to integrate new and different ways to motivate and teach today’s learner. MtDC began as my way of re-learning how to write and communicate, I am still learning – thanks for stopping by! As a student, I always looked forward to the first day back to school. As a teacher, I hated it. That’s when I realized the teaching profession was not for me. It sounds like you still get enjoyment from it. I hope so. That’s what the kids need! I just finished two days of staff development and I am excited about getting back into the classroom and starting school. Teaching is a lot of fun, I enjoy it and sharing my passions – reading and social studies and becoming a true learner. The digital age kids are a different breed of learners than our generation, they want to be efficient in their learning but don’t have all the tools, just yet. When school starts I’ll be writing about what’s going on in class, so stay tuned! Thanks for stopping by!